Why you have to peel the apples. How come you add cream to the flour mixture. What heavy whipping cream is. Yes he can taste sorghum and it's spelled S-O-R-G-H-U-M. The joy of motherhood, it can not be matched. Preheat oven to 375 Place the sliced apples in a large bowl, add in brown sugar, cinnamon and sorghum syrup. 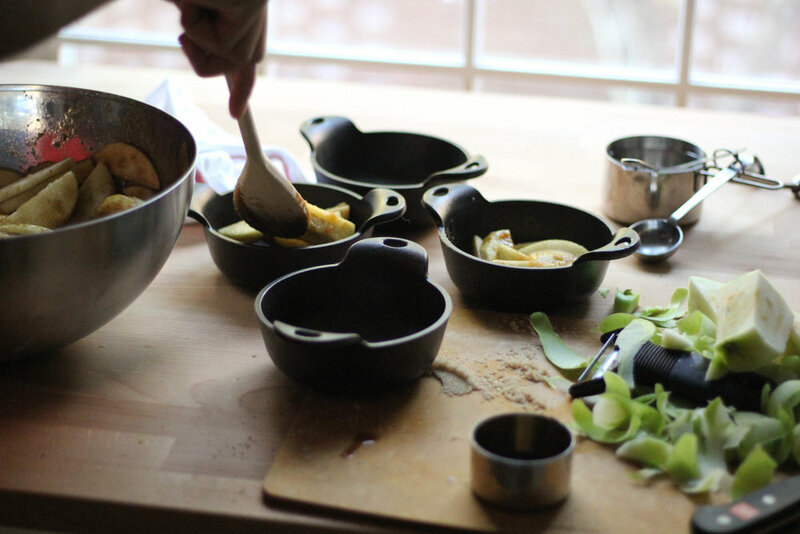 Divide apple mixture evenly among 6 small cast iron bowls or ramkins. In another bowl, whisk together the flour, cornmeal and salt. Slowly pour in the cream and gently stir into dry ingredients to form a wet dough mixture. Using a spoon (or floured hands) drop small rounds of dough into each small cast iron bowl (or ramkin) to cover the apple mixture. Bake at 375 for 15-20 minutes or until biscuits are golden brown. Serve while warm with a little sorghum drizzle on top if that's what you like. Check out all the dope creations whipped up by my fellow food blogging comrads as we celebrate Cythina and her new addtion.